America has Thanksgiving, but How Do Other Countries Celebrate the Harvest? The Thanksgiving countdown continues: 1 day until it's turkey time! Here at Gil Travel, we are excited to celebrate the upcoming holidays. Thanksgiving is all about enjoying the company of family and loved ones, while honoring the season of the harvest. Although Thanksgiving is mostly celebrated in America, other countries have harvest festivals as well. But how do these other countries celebrate? Let's take a look. Portugal's harvest holiday is packed with twists that vary from the traditional American celebration. Their observance only occurs every four years, in July. Their celebration is referred to as the "Festa dos Tabuleiros" which translates into "The Festival of the Trays." This makes complete sense, since the spectacle involves a lot of trays to be carried in the processions and parades that are held during the five-days of this happening. Women carry "tabuleiros" which hold about thirty loaves of bread, brightly colored flowers, and cobs of corn. A large amount of wine and cheese is consumed during this time to celebrate the excitement of the harvest. There is also a feast day involved, like our American holiday! Unlike America's holiday which is celebrated in late fall, India's harvest festival happens in late February or early March. Wheat is harvested in the earlier months of the year in Northern India. There are a few celebrations for this event—one of them being Holi. Holi is a time when families and loved ones get together to celebrate love and the condemning of evil. 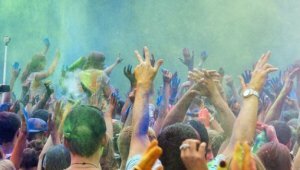 Participants gather and spray various colored powder on one another, and then eat and dance in celebration together. The festival has become such an iconic event that other countries around the world have been adapting it into their own types of celebration, because who wouldn't want to join in on a holiday where love is the central theme? The similarity to America's Thanksgiving is that we take the time to eat with our families and celebrate collectively as well. The Mid-Autumn Festival is typically held in September or October. This celebration revolves around the full moon cycles of the Georgian calendar and signifies the completion of the fall harvest. The beginning of this holiday can be traced back all the way to the days of the Shang Dynasty. Today, people celebrate this holiday by lighting and parading lanterns, indulging in scrumptious mooncakes, and spending time with loved ones. The ceremonious holiday is used to show gratitude for the harvest and to pray for a fortunate future. This idea of showing appreciation for the harvest certainly mirrors the American version of giving thanks on Thanksgiving. We gladly offer trips to all of these destinations. Who knows, your journey may even coincide with one of the exciting Thanksgiving festivals across the globe!